Would you make a good radiologist? Take our career test to find out how you match with this and over 800 other careers. What is the workplace of a Radiologist like? What is the difference between a radiologist and a radiologic technologist? What is the job satisfaction of a radiologist? How do I know if radiology is suitable for me? What is it like being a radiologist? What are the various specialties and subspecialties within radiology? A radiologist is a physician or medical specialist trained in obtaining and interpreting medical images. Images may be obtained with x-rays, (CT scans or radiographs), nuclear medicine (involving radioactive substances, magnetism (MRI), or ultrasound. The physician uses medical imaging in addition to the traditional tasks of examining patients, obtaining medical history, diagnosing illness and prescribing treatment. Since radiology is used in conjunction with most medical specialties, radiologists have a comprehensive understanding of physical anatomy and the components of human health. There are some subspecialties of diagnostic radiologists that include physicians who perform mammography and breast procedures, cardiovascular radiology, gastrointestinal and musculoskeletal radiology, and other specialties including those relating to pediatrics, emergency care, and oncology. This is a profession in very high demand as technological advancements have discovered more uses for medical imaging and techniques that are less invasive and more diagnostically accurate. There are some branches of radiology that include radiology assistants and technologists and radiation therapists. These health professionals assist the physician in conducting procedures and making clinical observations. The radiologic technologist often operates the equipment and works directly with the patient to obtain images. In many countries outside the U.S. and Canada, the term radiologist actually refers to one of these assistant branches. The radiologist interprets the medical images created by MRIs, CT scans, X-rays, and ultrasounds and must know how to operate all types of machinery used to obtain medical images. He or she also administers radioactive materials to the patient to obtain medical imaging. Radiologists working in larger hospitals or health centers often have a specialty. In nuclear medicine, a radiologist injects radioactive tracers into the patient's bloodstream. These radioactive substances are then followed to study blood flow and the action of the nervous system. The results are used to screen for a range of medical conditions and to assess general physical health. Once the results have been obtained and interpreted, these are taken to the patient's doctor and advice is offered. The doctor is responsible to make the final decision, based on the information provided. Much of the work involves interactions with other health professionals: the technologist, the oncologist and the physician. Some radiologists perform minor medical procedures with interventional radiology. One such technique is amniocentesis, in which a needle is inserted into a pregnant woman's amniotic sac in order to study the health condition of the fetus. Another specialty is therapeutic radiology, which involves using radioactive agents to treat disease. This would include oncology in cancer treatment. Are you suited to be a radiologist? Radiologists have distinct personalities. They tend to be investigative individuals, which means they’re intellectual, introspective, and inquisitive. They are curious, methodical, rational, analytical, and logical. Some of them are also realistic, meaning they’re independent, stable, persistent, genuine, practical, and thrifty. Does this sound like you? Take our free career test to find out if becoming a radiologist is right for you. Most radiologists work in a hospital or medical facility where the different types of radiation machines are available. Work can involve linear accelerators, which are used primarily in oncology for cancer care, ultrasound devices, and other types of x-rays. Although in larger centers an assistant or technician may perform much of the manual work in close contact with radiation and radioactive material, the radiologist must know how to operate all of the equipment and can also be exposed. In smaller centers, the radiologist operates the equipment and does the interpretation and diagnosis. Most work is done in an office setting, interpreting images, reading reports, and recording the results and diagnosis. Since most of the job involves interpreting results of radioactive imaging, patient contact is minimal. This is particularly true if the tests are performed primarily by a technician. Most of the dialogue is done through a patient's physician, who is responsible for applying the results and making treatment decisions. Those who prefer a more hands-on workplace often choose a specialty such as interventional radiology. This line of work for a physician tends to have greater flexibility in scheduling, less shift work and more vacation time. Both radiologists and radiology technologists work in a clinical or hospital setting, and are both health-care professionals. A radiologist is a physician that will interpret diagnostic tests and prescribe a course of treatment for the patient. They begin their education with a bachelor's degree, then attend medical school. After a two year internship, they take a residency in radiology for four to seven years. A radiologic technologist is the person performing the imaging tests on the patients (CT scans, MRI's, x-rays, and ultrasounds), who then hands them over to the radiologist for interpretation. The technologist needs to have earned either an associate's or a bachelor's degree before practicing, and must be licensed. Early on in medical school, it would be wise to pay attention to the role imaging plays in your cases. Keep your mind open to the specialty and what it entails, as this will give you a taste of what happens in radiology without committing a lot of time. Do some radiology electives, and try to spend time in different areas to get a good sense of what the resident and the radiologist do in their day. When watching the residents and the radiologists interpret films, ask good questions in between images. Talk to radiology residents, and ask them what the training is like, what they like and dislike about their specialty and their program. Talk to radiologists, and ask them what they like and dislike about their job. Ask them what their day is like. Ask them if they have any regrets about their choice of career. Ask if they can give you any advice that they wish they had received when they were first starting out. Radiologists are able to work with internal medicine, pediatrics, surgery, obstetrics, and all the sub-specialties, giving radiologists a huge range of things they can participate in. Although a radiologist is a physician, they generally don't interact with patients. In a way, radiologists are doctor's doctors. When a physician is not sure about a certain problem his patient is having, he will order a test (an x-ray, MRI, CT scan, or an ultrasound) and will sometimes consult with the radiologist personally to try and figure the problem out. Typically, whatever the results are that come back from the radiologist will determine the course of the patient's therapy. Even though a radiologist doesn't get a lot of patient recognition and gratitude for their work, they do get a lot of satisfaction in knowing that what they do makes a big difference in people's lives everyday. Radiologists specialize in obtaining and interpreting images for specific parts of the body. They can specialize in either diagnostic radiology, vascular and interventional radiology, or radiation oncology and can also become certified in a variety of subspecialties. In order to diagnose and treat disease, a diagnostic radiologist will obtain and interpret medical images by using X-rays, CT scans, radiograph, fluoroscopy, MRIs, ultrasound, electromagnetic radiation, and radionuclides. 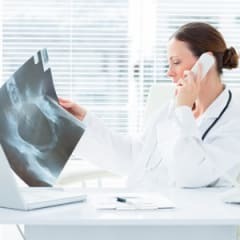 A radiologist can connect medical images to other examinations/tests a patient is getting done, can recommend further treatments, and can inform the patient's primary physician with relevant information. A vascular and interventional radiologist can diagnose and treat benign and malignant conditions of the abdomen, pelvis, and thorax with imaging and image-guided minimally invasive procedures. Radiologic imaging technologies that they use may include fluoroscopy, digital radiography, CT scan, sonography, and MRI. Therapies and treatments can include angioplasty, stent placement, ablation, embolization, biliary and genitourinary drainages, abscess drainages, and thrombolysis. Interventional radiologists diagnose and treat their patients using the least invasive techniques available (these techniques amount to less risk, less pain, and less recovery time compared to open surgery). A radiation oncologist is trained in the use of radiation therapy (radiotherapy) to reduce or eliminate the symptoms of cancer, and to treat malignant and some benign diseases. They may also use CT scans, MRIs, ultrasound, and hyperthermia to aid in treatment planning, as well as order tests, images, consult with other physicians, and prescribe medication. After treatment, radiation oncologists will evaluate the patient’s response to treatment and oversee the future care of the patient. A neuroradiologist is trained to diagnose and treat disorders and abnormalities of the brain, spine, and head and neck (this also includes the sinuses, spinal cord, and the central nervous system). They are able to interpret X-rays, angiography, myelography, MRIs, and CT scans which can help to diagnose strokes, tumors, genetic conditions, aneurysms, Alzheimer's disease, aging and degenerative diseases, cancer, seizure disorders, cerebrovascular diseases, and trauma. Neuroradiologists can perform minimally invasive treatments for disorders such as brain aneurysms, arteriovenous malformations, and compression fractures of the spine. A pediatric radiologist will diagnose, care, and manage congenital abnormalities, diseases specifically related to infants and children, and diseases that begin in childhood and can cause impairments in adulthood. They will use imaging and interventional procedures such as X-ray, ultrasound, CT scan, MRI, and nuclear medicine, interpret the results of the tests, and make an appropriate diagnosis. Pediatric radiologists also provide radiation treatment for children and teens affected by cancer. Children tend to be more radiosensitive than adults, and have a longer life expectancy than adults. This may lead to a greater chance of developing cancer from exposures to ionizing radiation. The paediatric radiology community has long been aware of this issue and has developed radiation protection policies and practices that reflect this. A nuclear medicine radiologist administers trace amounts of radioactive substances (radionuclides) and uses techniques such as scintigraphy, which uses radiopharmaceuticals, in order to provide images and information for making a diagnosis and deciding on treatment. Imaging procedures include positron emission tomography (PET), and single photon emission computed tomography (SPECT) scans. Radioactive materials can be injected into a patient's vein, be inhaled, or can be swallowed. Radiopharmaceuticals are used to treat thyroid cancer, solid tumors, hyperthyroidism, hematologic malignancies, or painful bone metastases. Thoracic radiologists specialize in all aspects of lung disorders and airway diseases, such as: interstitial lung disease, chronic obstructive pulmonary disease (COPD), lung cancer (primary and secondary thoracic malignancies), mediastinal masses, pleural disease, occupational disorders, emphysema, as well as diseases affecting the large and small airways (such as asthma, bronchiectasis, tracheomalacia). 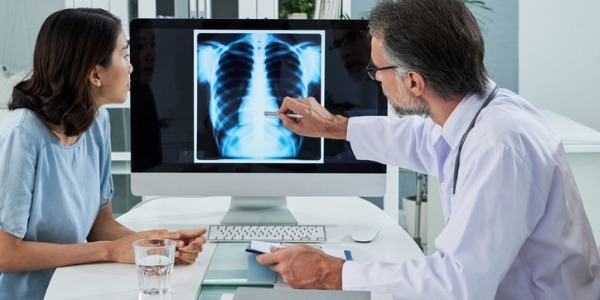 Thoracic radiologists use state-of-the-art technology, such as high-resolution chest CT, CT angiography of the aorta and pulmonary arteries, and conventional chest radiography. A musculoskeletal imaging radiologist orders and interprets medical images of bones, joints and associated soft tissues, and diagnoses injuries and disease. They do various types of diagnostic work, including sports injury imaging, tumors, arthritis, infections, and bone diseases by using X-rays, fluoroscopy, CT scans, ultrasound, and MRI scans. A typical scenario where a musculoskeletal imaging radiologist would come into play - a patient goes to see their general physician with a problematic knee or shoulder, the doctor will then direct the patient to get a medical image where a musculoskeletal imaging radiologist will then carefully interpret the scan by using his or her diagnostic expertise. The patient's general physician will receive and review the imaging report sent from the musculoskeletal imaging radiologist and will coordinate the information with the patient's overall care.